Will it be a white Christmas this year? We always hope so. Snow can be a beautiful sight to behold, but it can also cause major disruption. Adverse weather conditions lead to cancelled travel plans, traffic incidents and injuries from slipping over. We are fortunate in Britain not to suffer from extreme snowfall, seen most recently in North-Eastern US where it was estimated that up to 8ft fell over three nights. But it doesn’t mean we shouldn’t still be prepared. 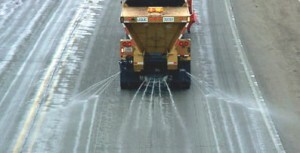 Gritting Britain’s roads with rock salt is vital to keep the country moving and without salt, it is estimated the weather would impact the economy to the tune of £2billion. But clearing the roads helps more than just the economy. It clears the way for emergency services, delivery services, commercial transport and makes sure you can get home to your friends and family. You can also play your part, by salting your driveway and pavement to make surfaces safer to walk on. Often taken for granted, salt plays a huge role in making sure weather conditions do not lead to any serious accidents or delay. UK produced rock salt comes from three locations: Compass Minerals UK in Winsford in Cheshire, Cleveland Potash in Teeside and Irish Salt Mining in County Antrim. It is then distributed throughout the country to local councils who are responsible for keeping the roads clear over winter. Councils are now utilising their websites to keep residents informed of the major routes that will be salted. Your local council should also display a similar map, so it is worth checking them out before setting off on the road this winter.